This Christmas, London's Southbank Centre will be filled with festive cheer as The Choir with No Name, an organisation which runs pop choirs for people who've experienced homelessness, descend on the iconic Royal Festival Hall for their Big Christmas Singalong, part of Winter at Southbank Centre with NatWest. The Choir with No Name are no strangers to high profile gigs – from supporting Coldplay and Paul Weller, to performing at the Royal Opera House - but this year's Big Christmas Singalong will be the biggest Choir with No Name headline concert since their inception seven years ago, making this a hugely exciting milestone for choir members. Founder & CEO Marie Benton said: “We are thrilled to be performing in such an iconic venue as the Royal Festival Hall. Our Christmas gigs are by far the highlight of our year, with members and audiences alike singing their hearts out and feeling part of something very special. It's a big space to fill but we're hoping the choirs will be performing to a full and energetic audience!" The Choir with No Name encourage the crowd to get involved and sing along to a whole host of Christmas favourites, from Fairytale of New York to I Wish It Could Be Christmas Every Day, and will be joined this year by the fantastic all male Chaps Choir and Southbank Centre's own Voicelab. The Choir with No Name provides a safe and positive environment for those who have been affected by homelessness or are marginalised due to other factors such as mental health. They get a hot, nutritious meal after every rehearsal and have the opportunity to make friends, learn new skills and find their feet again. The choirs provide a welcome platform for members to sing their hearts out on a regular basis – a hugely important way of building confidence and general wellbeing. There are four choirs - in Birmingham, Liverpool and two in London – reaching over 500 vulnerable adults in the last year alone, with plans to expand into other cities across the UK in the future. All profits from ticket sales will go directly back into funding the choirs and helping the charity reach out to more people affected by homelessness across the country. 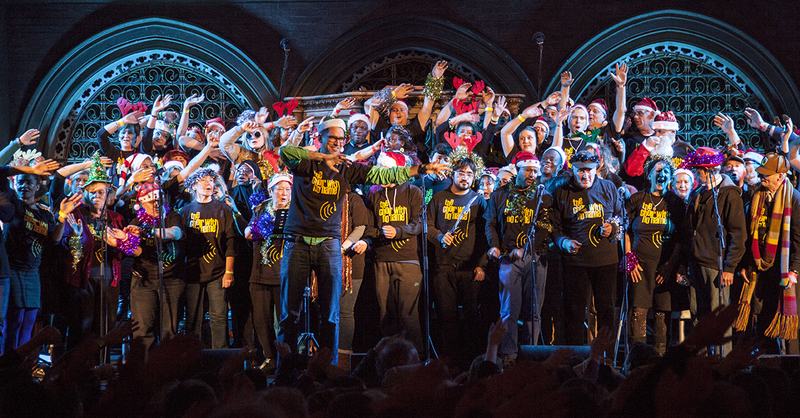 Be part of something extraordinary, and come and join in with the Big Christmas Singalong. Dec 11th 2015, Southbank Centre's Royal Festival Hall. Founder & CEO Marie Benton and choir members are available for interview on request. Southbank Centre is the UK's largest arts centre, occupying a 21-acre site that sits in the midst of London's most vibrant cultural quarter on the South Bank of the Thames. The site has an extraordinary creative and architectural history stretching back to the 1951 Festival of Britain. Southbank Centre is home to the Royal Festival Hall, Queen Elizabeth Hall, Purcell Room and the Hayward Gallery as well as The Saison Poetry Library and the Arts Council Collection. The Royal Festival Hall reopened in June 2007 following the major refurbishment of the Hall and redevelopment of the surrounding area and facilities. Winter at Southbank Centre with NatWest returns for another year focusing on the themes of family, charity and giving to others. The programme is once again packed with fun and entertainment for all ages, from award-winning theatrical performances including La Soirée and Slava's Snowshow, to festive concerts, social dances, choirs and a weekend specially dedicated to fundraising and charitable causes. The site will be transformed with canopies and pathways of twinkling lights, bustling markets lining the riverbank, and alternative winter activities including a roller disco and the return of Southbank Centre's Vintage New Year's Eve Party. With many elements opening on site from 20 November, activity will reach full swing on 4 December and run throughout the festive period.